Reserve Bank of India (RBI) invites application for the post of 526 Office Attendant in various offices of the Bank. Apply Online before 07 December 2017. 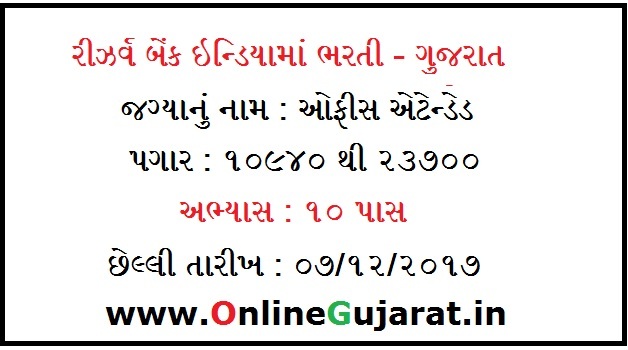 Apply After Read Caryfully Advertisement Details and Information Like Essential Education Qualification / Eligibility Criteria, Age Limit, Department / Organization, Post Name, Total Post, Selection Process, Salary / Pay Scale, Application/Examination Fee, Exam, Syllabus, Application Process, Important Dates of Application, Call Letter, Result Check and Read Carefully on Official Advertisement Notification Download from Official Website before Apply . RBI – 526 Office Attendant Job at rbi.org.in Recruitment Details/Description & Information/Instruction. General, SEBC/OBC, Scheduled Castes / SC, Scheduled Tribes / ST, Physically Handicapped / PH and Ex-Servicemen, Woman candidates Age Limit each category may different as per norms read in to official notification. Candidate should have passed 10th Standard (S.S.C./Matriculation) from the concerned State/UT and candidate should be a domicile of the State/UT coming under the Regional Jurisdiction of the Recruitment Office to which he/she is applying. Selection will be based on Online Test and Language Proficiency Test (LPT). Candidates have to pay Rs.450/- (Rs.50/- for SC/ST/PWD/EXS) hrough Online using Debit Cards (RuPay/Visa/MasterCard/Maestro), Credit Cards, Internet Banking, IMPS, Cash Cards/ Mobile Wallets. General, SEBC/OBC, Scheduled Castes / SC, Scheduled Tribes / ST, Physically Handicapped / PH and Ex-Servicemen, Woman candidates application fee should be paid separately for each category may different as per norms read in to official notification.